To say there are a lot of molecules out there is kind of an understatement. So searching for one or two in particular is like looking for a needle in a galaxy-spanning haystack. Fortunately, the science of machine learning and the irrepressible need for humans to swipe left and right on things make the search a lot easier, as Harvard and MIT researchers have found. The molecules they’re looking for are blue organic phosphors, a critical component for organic light-emitting diodes — likely the next big step in display technology. OLEDs rely on molecules that produce light of a specific wavelength when introduced to a current, obviating the need for the backlights found in ordinary LED displays. This means the screen could be thinner, more flexible, and more power-efficient, among other things. 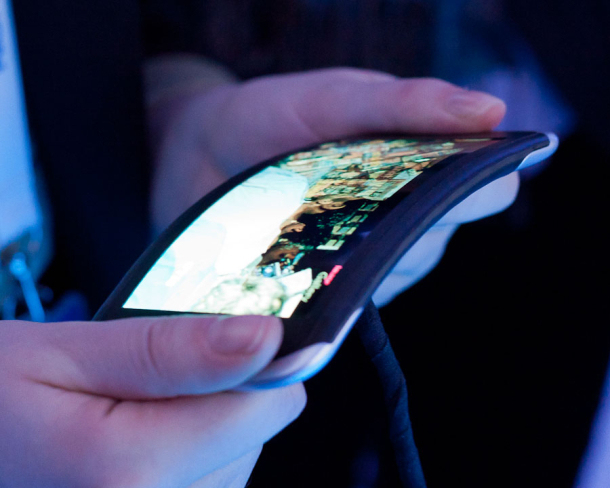 A flexible OLED screen from Nokia. Suitable phosphorescent molecules have been found for creating red and green light, but making blue has been a tough proposition for years. Existing OLED screens use expensive elements and their longevity isn’t so hot — it’s one of the main challenges to widespread adoption of the technology. Researchers feel sure that the molecule they want is out there — and many have found ones that are suitable in one way or the other (the one up top is a recent example from the University of Michigan), but no one has found one that does everything right. To begin with, the team built a library of some 1.6 million organic molecules that could conceivably fit the bill. This huge database was scoured by machine learning algorithms designed by Ryan Adams, also from Harvard, in order to thin the herd. This elite cohort of molecules was then simulated, at a rate of about 12 hours per molecule, to find out more or less how bright and how blue each was likely to be. Then it was time to ditch the artificial intelligence and bring in the human kind. 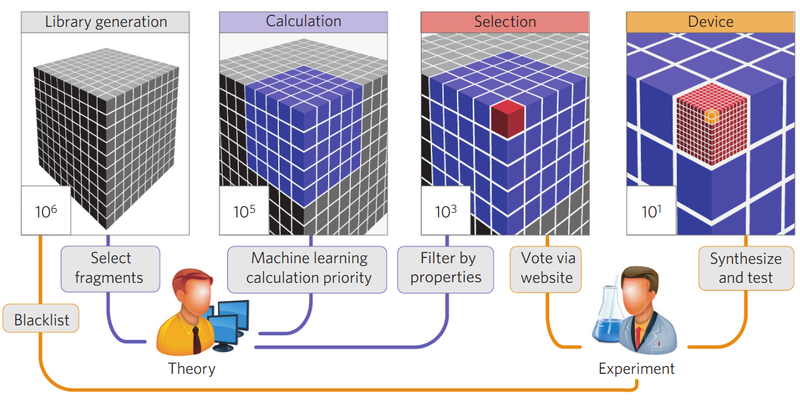 The “discovery pipeline” that reduced the number of choices from millions to hundreds. The result is a group of potentially hundreds of molecules that are the absolute cream of the crop skimmed from a sea of millions — and no one even had to draw their micropipette or spin up a centrifuge. Well, that part comes next, anyway. It’s unlikely these molecules will be ready for manufacturing in time for the rumored OLED conversion of the iPhone, but they could very well contribute to the all-but-inevitable migration of the industry in that direction over the next few years. The paper describing the research was published today in the journal Nature Materials.